The Writers Alley: Publication versus Calling - What's your motivation? Publication versus Calling - What's your motivation? I was having a discussion with a friend recently and we were talking about the journey toward publication. Publication comes in many forms, you know – but the most common is the long road (not the short cut). Weak motivation leads to an incomplete (and two-dimensional) journey. In the Merlin series, Merlin is a young man who is destined to protect Prince Author so that he can become the ‘one true king’ of Camelot. What are Merlin's obstacles? 2. Arthur’s half-sister Morgana wants Arthur dead (but only Merlin knows this and has to keep it a secret. 4. 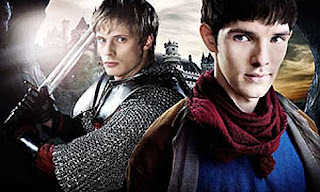 Merlin is mistreated because he’s a servant in the king’s house. But Merlin won’t do that. He has a deeper motivation pushing him beyond his frustrations. A more just and glorious Camelot for all. A place of peace - where people are respected and the kindgom shines like a beacon to other kindgoms because of the future King Aruthur. Prepare and protect Arthur for that day. What am I trying to say in all this? Publication is third to Calling & Story. If your only goal is publication, without the backbone of something greater holding you on the journey, then when the conflict, harsh critiques, massive edits, and daunting deadlines confront you like an army for battle, it will be easy to lose your way or give up. There has to be something deeper to your writing. Something stronger that holds you to your task. The Calling – Loving to write is one of the strongest and most enduring weapons in a writer’s perseverance arsenal. Just finding joy in the process of creating and growing through writing. If it is deepset within you – no amount of struggles will dissuade the love. You might have to take a break for a while due to various circumstances, but the thread of creativity lingers. Calls. Waits in the wings of your quiet moments and whispers another story to you. The Story – As Christians, our hope should be to write a meaningful story. It can be lighthearted, serious, suspenseful, fantastical, or whatever else, but one of our goals should be to make it ‘sing’. That’s why writing is such a tough job…rewarding, amazing, but TOUGH. To write a memorable story, it takes work – but if God has ‘called’ us to write, He will also equip us with the ability (or at least the resources) to build a story worth telling. He creates the stories first and then passes them on to us. So – what is your motivation for writing? Is it just to achieve publication or is there are deeper call within your heart? Have you ever had to take a break from writing because ‘life happened’? How do you deal with those moments and still get back on the writing journey? Great questions to consider, Pepper. My biggest motivation for writing? I know that God made me to write. I am being who I am meant to be in so many ways when the words are flowing (or even not flowing so easily) onto the Word document. And, yes, sometimes real life trumps the writing life. I have to accept that. Sometimes I accept it more graciously than others. Argh I love Merlin too! I guess you're writing from the US? This confused me at first because we must be a head of you a little where alot has changed. Man - it's sooo good. Definately, my desire for publication is purely because I want the story to get out there. It's definately a higher thing. "I am being who I am meant to be in some ways when the words are flowing". It's funny how 'life' can trump the writing but it never seems to trump the creativity - which I guess would be the same as the calling and the story. I love the way you worded this and I've saved it in my read this when your down file. Thanks Pepper. I couldn't have asked for a better wake me up boost of encouragement. Are you in the UK? My boys have done research to see what the Merlin series is going to be like. We just finished the final episode of season 3 where King Uther (and everyone else for that matter) realizes Morgana is bad. I was kind of sad to see her turn to the dark side because she seemed so sweet, but boy when she turned bad...she turned BAD. And she'd have to be to stick with Arthur legend. Glad to know you have a deeper motivation with your writing. It makes our work richer when we do. I write because I have a love affair with the written word. Coming up with a clever turn of phrase fills me with joy. Creating a story from the ideas churning in my imagination brings about a high that surpasses anything substances could induce. Sure, publication is nice, but if that were the primary goal, many writers would quit after their first books hit the shelves. But they don't, even through writing a book takes countless hours and rarely produces income commensurate with the time invested. I believe most of us write because we love the very process of writing. You got me tight where I am, Pepper! I have been trying to decipher between my desire to get published and my calling. And I have finally come to terms with my circumstances are putting me on hold whatever it is. It's funny how life works out, because when I finally get interest in my work, I can't move forward with it right now. God is constantly teaching me patience... So I am just going to sit back and let him take the reigns! Good post! That was suppose to be right... I am on my phone ao it puts in what it thinks I mean! You didn't know, but this post answered a question I had flittering around in my head yesterday and today. I'm fairly new to the writing world, but I sooo agree with what you've shared. I came face to face with the possibility that the story I'm working on may be a story of my heart. I'm okay with that. I love writing. Watching my characters surprise me, weaving in the spiritual truths they need to hear. I plan to learn and craft it for God's glory. If He chooses to publish it, I'll be over the moon thrilled. If He chooses not to, it's his story. I love your stuff, Pepper. Thank you! What a blessing we have in knowing the One True God is at the center of what we do. I'm with you. "most people write because of the very process of writing"
I absolutely love to create a story and see what happens along the way. IT's a challenge, but a delight too. I'm so glad this post touched you right on time. That's right. With that perspective in mind, we all grow in our writing for His glory. Thanks, Amber. Glad to be an encouragement.